Can you believe it, we're already approaching the end of 2014? But, just because the summer is over, it doesn't mean that London closes down for the winter. Far from it. Indeed, from a personal perspective, I much prefer exploring London in the "off" season when it's not so crowded, and some of the lesser know attractions really come to the fore, so to speak. In addition to the regular monthly list of things do in London, I also post updates on our Facebook page when I come across something that I think my readers might enjoy , so you might like to join us and like us (as in Facebook likes!) to ensure you're kept fully informed of what's going on in London throughout the weeks ahead. In addition, if anything changes on the list, I can simply place the update on the Facebook Page. So, without further ado, here is my October list of ten things to do in London. St John's Lane, Clerkenwell, London, EC1M 4DA. Hidden away in the backstreets of Clerkenwell you will find tis remarkable survivor, which has the distinction of being London's only surviving Medieval gate. Built in 1504 as the grand entrance to the monastery of the Knights Hospitallers, the gate has seen numerous uses, including acting as the office of the Master of the Revels, in which capacity it was, no doubt, visited by William Shakespeare himself. The adjacent museum displays the history of the Knights Hospitallers through to its current connections with St John Ambulance. The museum is open free of charge Monday - Saturday, from 10am - 5pm and tours of the gate take place on Tuesdays, Fridays and Saturdays, at 11am and 2.30pm. There is a suggested donation of £5 for the tours. The nearest underground station is Farringdon. 32/34 Whitechapel Road, London, E1 1DY. If you've not yet visited the Whitechapel Bell Foundry, you've missed out on one of London's best kept secrets. Mind you, given there is a long waiting list to get on the tours (which cost £14), it would appear that it is not that well kept a secret! According to the Guinness Book of Records, the Whitechapel Bell Foundry is Britain's oldest manufacturing company, having been established in 1570 (during the reign of Queen Elizabeth I) and being in continuous business since that date. Big Ben and the American Liberty Bell are just two of the famous bells to have been cast here and the premises, occupying as it does, a corner location on Whitechapel Road, is a true throwback to a bygone age. Visits are confined to selected Saturdays with tours commencing at 10.00am, 1.15pm, and 4.00 prompt, and, be warned, there is NO late admission. They are now taking bookings for 2015, so it's wise to get your booking in as soon as possible as the tours will sell out. In addition to the tours you can also visit their museum which is open for public viewing Monday to Friday, between 9.00am and 5.00pm. Now, before anyone corrects me, I know that I'm not actually referring to Big Ben when I talk about climbing the Elizabeth Tower that accommodates the World's most famous bell, which is, in fact, the aforementioned "Big Ben". But, if you are a UK resident, and are reasonably fit, you can actually climb the 334 stone spiral steps to the top of the Elizabeth Tower and hear the Great Bell, Big Ben, strike the hour. In addition to this truly unique experience (for which you might want to take ear muffs with you), you can also enjoy a truly spectacular view of London. The tours take place at 9.00am, 11.00am and 2.00pm Monday-Friday (except Bank Holidays) and are free of charge. There is also a tour at 4.00pm from May to September. UK residents (the tours are not available for overseas visitors, nor for children under 11) can arrange their visit through their local MP or a Member of the House of Lords, if they know one, to arrange a tour. However, it is an extremely popular tour and there is currently a six month waiting list, so it's worth getting that request in quickly as your MP might be otherwise occupied next year! In 1982, when I first started doing my walking tours around London, I heard a programme on Radio 4 (in the days when it was a cool and hip young station!) about a remarkable house in the East End of London where a man from California had created one of the most unique tour experiences in London. I, therefore, traipsed round to Folgate Street where I found myself standing outside an old front door with a canary in a cage hanging alongside it. Nervously I knocked on the door and, a few minutes later, an upstairs window opened and a jolly American leaned out and shouted down to push the door as it was open. Once inside, I had the honour of meeting the amazing, and wonderfully eccentric, Dennis Severs, who treated me to a tour that was unlike any I had ever been on before. It was magical and enchanting, and Dennis himself was a gracious and enthusiastic host. Sadly, Dennis Severs left us in 1999. But his guiding spirit is still in evidence in the house that he created and where, and I quote here from Dennis's original script, the house's ten rooms "harbour ten "spells" that engage the visitor's imagination in moods that dominated the periods between 1724 - 1914. Your senses are your guide." The house is open every Sunday from 12 - 4pm (last admission at 3:15pm) and admission costs £10 for adults or £5 for under 12's. No booking required. It also opens on selected Mondays from 12 - 2pm (last admission at 1:15pm) and costs £7 for adults and £3.50 per person for under 12's. No booking required. The nearest underground Station is Liverpool Street. Have you ever fancied sitting in Graham Norton's big red chair and suffering the humiliation of being thrown backwards in front of millions of viewers? Have you ever wondered how all those people got to be members of the audience for Have I Got News For You or Room 101 ? Well, if the answer to either of these questions is yes, or even if it's no but your curiosity has been tweaked, then it's really easy to apply for free tickets to join a television programme recording. A quick scan of the programme's currently available reveals such gems as Neil Diamond (swoon) and Jonathan Ross (aaghhh). But the one that's really caught my imagination is the "reputable TV company...filming a hidden camera comedy show for a major TV network." who are looking for people who have a "squeamish friend, family member or partner that you would like to play a scary prank on? Just for fun!" The experience of watching Tower Bridge raise is a truly magical experience and, having witnessed it numerous times, I am still enthralled by it. One of the best locations to watch it from is the causeway on the river side of The Tower of London. 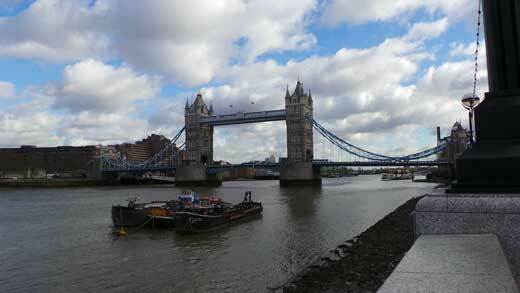 The dates and times when the bridge will be lifting are listed on The Tower Bridge Website.. There's no doubt about it, Westminster Abbey is a special place, but it can get crowded and its spiritual side is often hidden by the hordes of visitors who flock to visit it. With half-term approaching you might like to take the kids, or the grand kids, or even yourself, on my free tour of the Harry Potter film locations dotted across London. This is a print off and do yourself tour that provides step by step directions for getting around London. It also features a treasure hunt and quiz that will keep the kids occupied throughout. The whole tour takes a full day to do, or you can split it into two tours over several days. This great little museum is hidden away in one of the backstreets behind the Royal London Hospital. The Museum features the history of the hospital since its foundation in 1740, and includes a display on Joseph Merrick, the "Elephant Man", who was discovered being exhibited in a freak show at a shop on the opposite side of the Whitechapel Road from the hospital. Other exhibits concern former London hospital nurses Edith Cavell and Eva Luckes. There is also a showcase on forensic medicine which features material on the Whitechapel murders of Jack the Ripper. The Museum is open Tuesday-Friday from 10.00am to 4.30pm and admission is free, although donations are encouraged. From October 19th 2014 to 12th April 2015 The Museum of London will be hosting an exhibition that should appeal to all lovers of the World's greatest ever consulting detective, Sherlock Holmes. Entitled Sherlock Holmes -The Man Who Never Lived And Will Never Die the exhibition promises to transport visitors back to Victorian London and, through early film, photography, paintings and original artefacts, recreate the atmosphere of the London of Sherlock Holmes. Booking is required and there is an admission charge of £12 for adults and £10 for concession (ages 12-15, students, over 60, unwaged and registered disabled). I hope you find the October list useful and that you get to enjoy at least some of the things that I have suggested. I'll be conducting several walks over Halloween week looking at different areas of haunted London. Over the Christmas period I'll be donning my Ebenezer Scrooge outfit and leading a festive walk through the streets that featured in A Christmas Carol. One of my favourite parts of London is the Inns of Court. I just love the secluded courts and flagstones passageways that snake their way through this magical quarter of London. So, for this month's video, I've put together a short photo film of the area, featuring the various locations that you come across when you venture into this time-slip part of London, and added a sound track composed by the folk at Shockwave sounds.